With rapid economic progress and increasing life expectancy in East Asian societies, more attention is being paid by their governments, the media and the academy to mental illness and dementia. While clinical research on mental illness and dementia in Chinese societies acknowledges the importance of culture in shaping people’s experiences of these illnesses, how Chinese culture shapes people’s understandings of and responses to mental illness and dementia has yet to be interrogated to any depth. Mental Illness, Dementia and Family in China breaks new ground in exploring how Chinese culture, namely, the understandings, norms, values and scripts that people acquire through being members of a Chinese community, shapes contemporary stories of mental illness, dementia and family care-giving. This book is innovative in examining and comparing stories which have been drawn from both real life (‘life stories’), as well as from film and television productions (‘filmic stories’). These two forms effectively complement each other, with life stories generally presenting an ‘insider’s’ account and filmic stories generally presenting an ‘outsider’s’ account. What remains unvoiced in one kind of story may be voiced in the other kind. 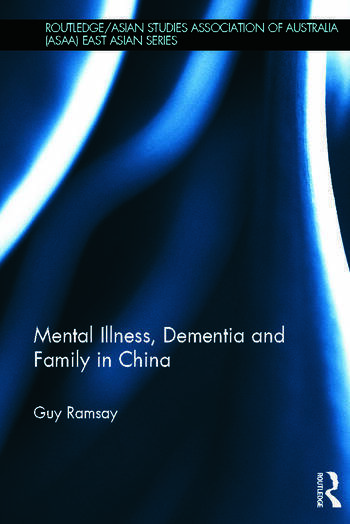 Drawing on the perspectives and analytic approaches of narrative analysis and cultural studies, Guy Ramsay uncovers culturally-shaped continuities and departures in representations of time, identity and cause of illness as well as in the language employed in contemporary stories of mental illness, dementia and family care-giving in China. This book will be invaluable to students and scholars working on Chinese cultural studies and Asian social policy, as well as those interested in psychiatry, mental health and disability studies more broadly. Guy Ramsay is Senior Lecturer in Chinese Language and Studies at the University of Queensland, Australia.